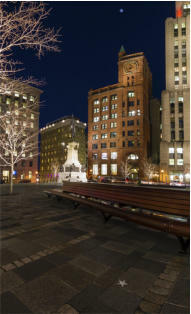 Polaris has not always been the North Star. As the Earth spins on its axis it wobbles in a slow circular motion like a child’s top. 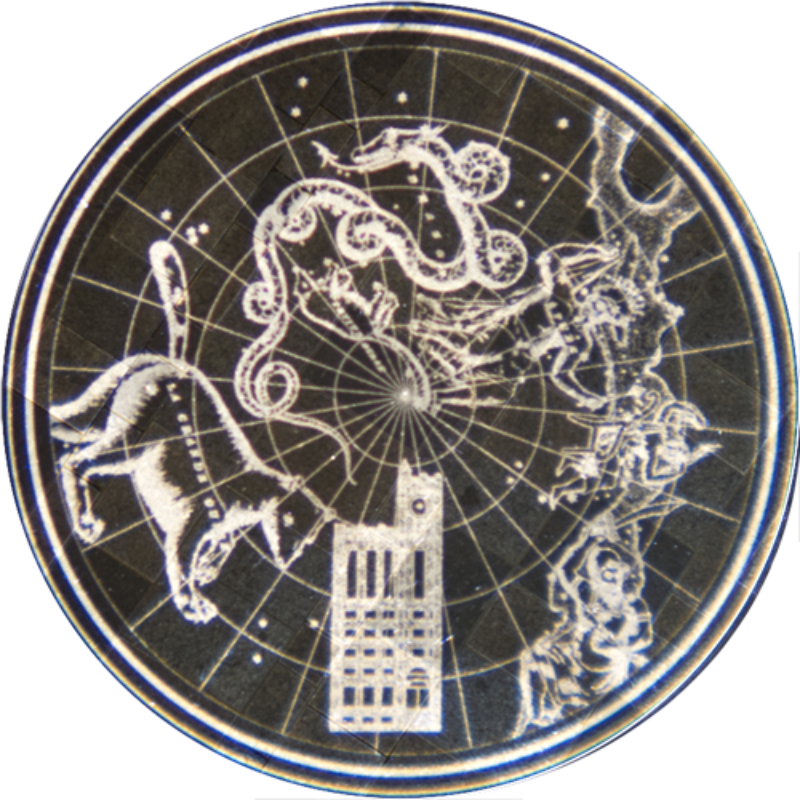 This is called precession and means that the Earth’s North Pole points to different stars over a 26,000 year period. In 2,800 B.C. when the Egyptians were building the pyramids, the North Celestial Pole was near the star Thuban in the constellation of Draco, the dragon. 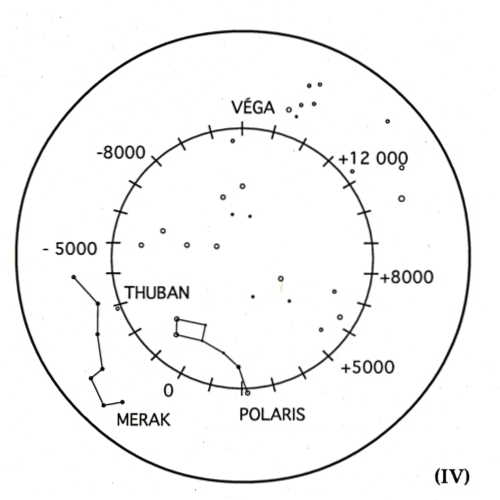 When Julius Caesar ruled the Roman Empire in the first century BCE, the North Celestial Pole was between the star Merak in Ursa Minor and Polaris. In 12,000 years from now it will be near the bright star Vega in the constellation of Lyra, the harp. Polaris is located almost directly above the Earth’s North Pole. 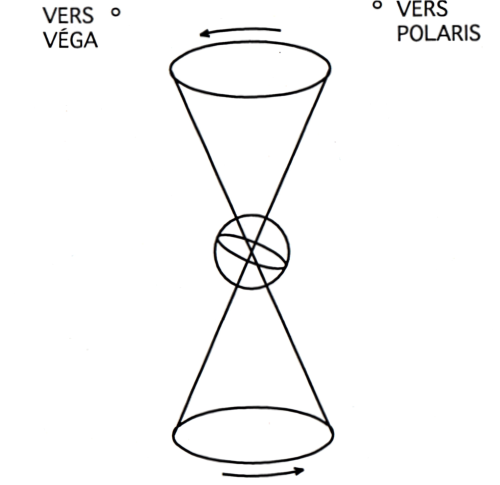 Due to a slight offset from truth north, Polaris describes a small circle around the North Celestial Pole as the Earth rotates. Polaris forms the tip of the tail of Ursa Minor—the Little Bear—also known as the Little Dipper. A yellow supergiant situated approximately 700 light-years from the Earth, Polaris has a diameter almost 70 times that of the Sun and shines 5,500 times brighter. 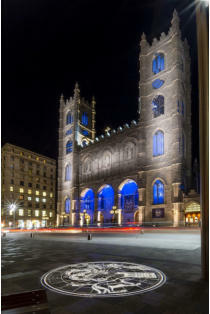 Light projection by Gilles Arpin, Éclairage public; constellations adapted from James Middleton’s Celestial Atlas (1842); drawing of New York Life Insurance building by Katsuhiro Yamazaki, photos of Polaris en lumiere projection by Isabelle Riendeau and Steve Bilodeau Balatti. 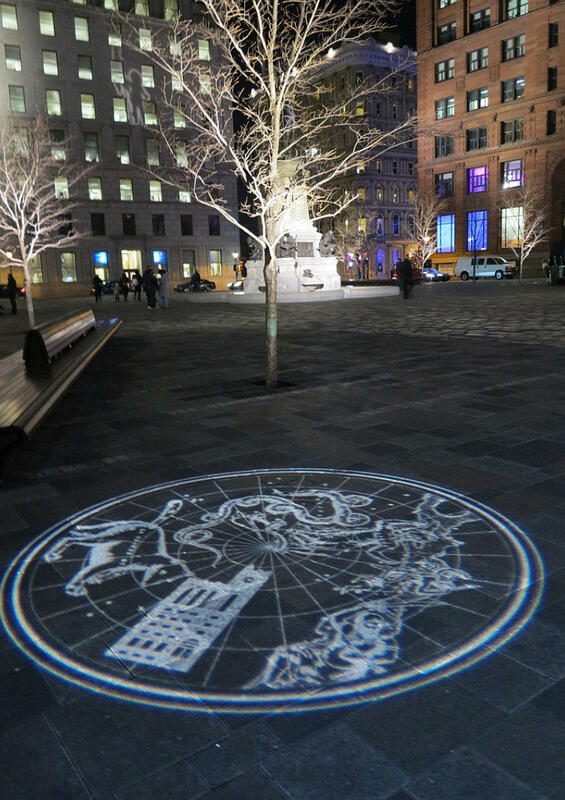 Each night a 19th century star map is projected onto the pavement of Place d’Armes. 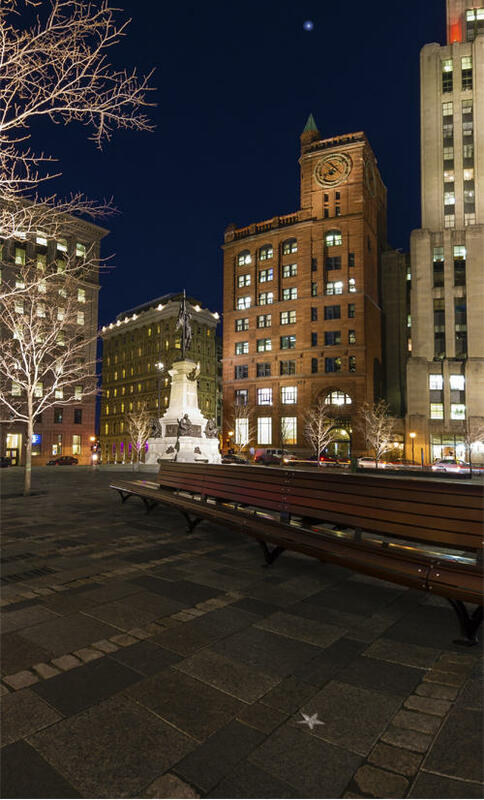 The map displays Montreal’s first office tower, a red sandstone building completed in 1888, and above it, Polaris, the pivot around which the stars of the northern hemisphere appear to move. 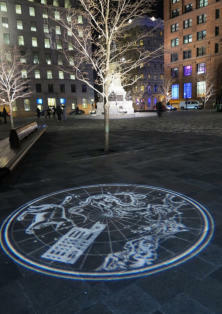 The light projection was created to replace the original Mundus plaque when Place d’Armes was redesigned in 2011. 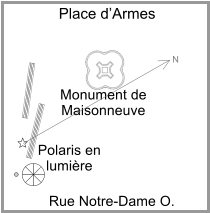 Polaris can be viewed on any clear night, preferably when the moon is not full. 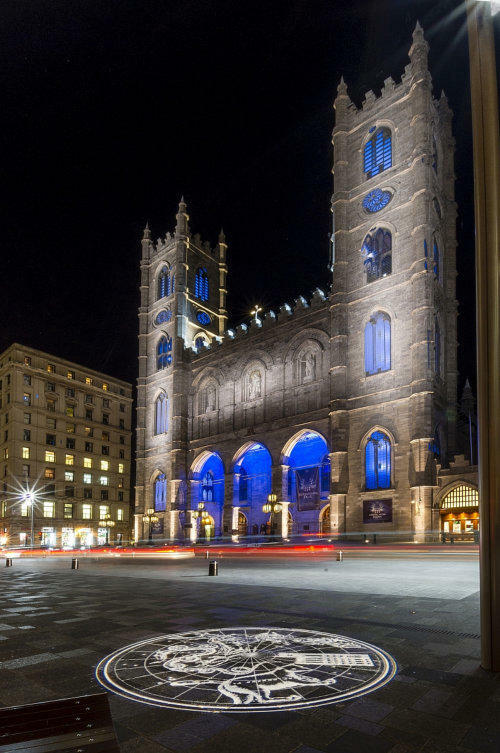 A paving stone with an engraved star seven meters from the projection indicates exactly where to stand to view the North Star above the turret of the building.